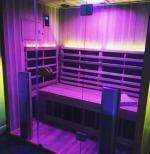 Hi, my name is Emma and I absolutely love my infrared sauna. I had read a lot about the so-called weight loss super powers of the infrared sauna prior to my purchase of my sauna, but I have to admit that I was skeptical about it and that I decided to buy my sauna anyway, regardless whether it would help me to lose a few pounds or not. I lost a few pounds that were troubling me, but I admit that I try to have a healthy lifestyle, get regular exercise and try to eat balanced. In addition to that I go in my sauna 2 to 3 times a week and I find it super relaxing. I believe that the relaxation also helps with weight loss because when the body is under stress, cortisol levels in the bloodstream are raised and cortisol is linked to weight gain. Thanks for the very informative website and for the opportunity to contribute on this page.